We here at Happy Dance get lots of interesting questions, from “Can you include macaroni art in a quilt?” to “We want to use tarp for the back of our quilt. Can you do that?” But one of the most common questions we get is: “How many shirts do I need to make a quilt?” We answer that question and more today! What’s the minimum number of shirts I need? On the small side of things, you might be wondering what’s the fewest number of shirts you need for a quilt. You might be surprised to know that the answer is 5! Yep, with only 5 shirts, we can make a t-shirt quilt that will have 9 squares total, and is what we call “wall hanging” size. 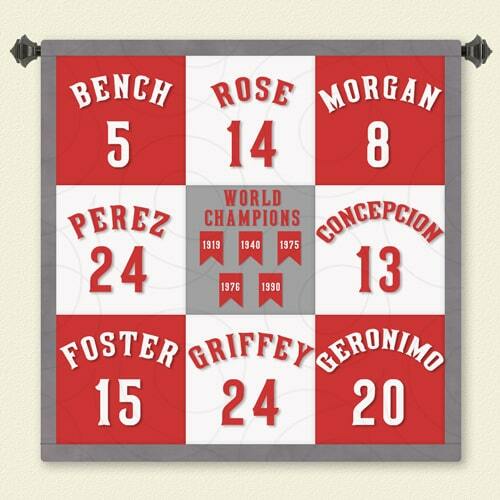 The perfect lap quilt. Do you legs get cold when sitting for extended periods? Do you dislike sharing blankets on the couch ;)? This quilt is just big enough to tuck around your legs to stay nice and cozy. Activity blanket for toddlers. This quilt’s more modest proportions make a great size to use as a cushioned, clean play surface for your little one, and can double as a blanket for car seats or strollers when the weather gets cold! Wall hanging. This size is ideal for showcasing a small collection of shirts, and won’t overcrowd a wall. Imagine using jerseys from the most famous players on your husband’s favorite sports team! It would be the perfect addition to any mancave. We can attach hanging sleeves to any size quilt, so you can tastefully display it on a wall-mounted curtain rod. Do you only have 4 (or fewer?) shirts? We can still likely work something out, using other types of fabric or incorporating photo squares into the quilt. What’s the maximum number of shirts I can use? This is a much trickier question to answer! Technically, there is no maximum number of shirts you could use in a quilt. However, after a certain point, your quilt would be so large that it might not be convenient to use. If you have a large collection of t-shirts (40 or more, just to put a number to it), we have a few options for you! Option 2: Make a mosaic quilt. Our mosaic quilts tend to be smaller than our traditional t-shirt quilts. For more info about mosaic quilts, go here. Option 3: Make multiple quilts. Often when you have a large collection of shirts, there are a few different themes to the shirts and clothing. For example, you might have a lot of shirts from high school, your sorority, your softball career and shirts from places you’ve traveled to. 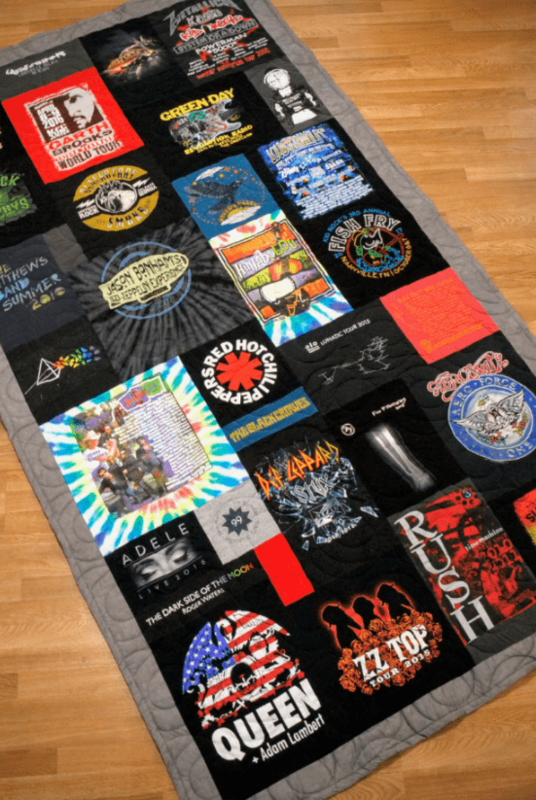 You could certainly combine all those shirts into one large quilt, but you might consider making different smaller quilts to represent these different areas of your life and memories. How many shirts should I use? Is there a magic number? This is the million-dollar question! Bottom line: the shirts that are most important to you are the ones that need to be in the quilt. We can make a beautiful quilt out of those, no matter the number. Our biggest piece of advice when it comes to t-shirt quilts is to not focus on quilt size (think, twin size or queen size). Sounds counterintuitive, right? We’re making blankets, after all! While we are creating a quilt, what we’re really doing is preserving your or a loved one’s memories in a durable piece of functional art. Ten years from now, will you be happy knowing that your most precious shirts are preserved in your quilt or knowing that you included a shirt you don’t actually care about (or worse, didn’t include a piece of clothing you loved) just so you could make a twin-sized quilt? Chances are, size will be less important to you in the long run than the shirts that are in the quilt! For example, maybe right now you’re envisioning the quilt being used as the comforter for your daughter’s dorm room bed. If you have the right number of shirts to make a twin-sized quilt, then that’s great! But what if you have too few or too many shirts for a twin quilt? Now that you’re in the mindset of, “I have to use this number of shirts,” you’re in a tough position: do you add shirts that aren’t as meaningful if you have too few? Or not use some shirts that have sentimental value if you have too many? This is the reason we recommend you not focus on blanket size. This scenario wouldn’t even come up, because however many shirts you have is the right number. Our quilts are made to last a lifetime, so we always recommend you think about what’s important in the long run: preserving memories. Key Takeaway: Almost any number of shirts will work! We hope this guide helped clear up the question of how many shirts you need to make a t-shirt quilt. But more importantly, we hope you’re now armed with the knowledge of what really makes an amazing quilt: having the shirts and clothes that are most important to you in it, regardless of how many shirts that is. Are you ready to order? Go here now! https://happydancequilting.com/wp-content/uploads/2018/07/v1-Test-Banner-for-t-shirt-quilt-page.png 600 1280 Justin Justin2018-08-01 08:00:312018-07-27 15:04:13How many shirts do I need to make a t-shirt quilt?